March is Music in Our Schools Month. In support of music programs, music educators, and wiggling students trying to sneak a beat, we are celebrating (global) Music in Our Schools Month with DRUMS! Can’t decide on a theme for your birthday party? No problem—just put them all together! At least, that’s Marisol McDonald’s philosophy. 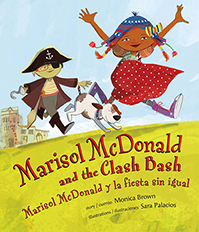 Get ready for a princess-unicorn-soccer themed party like you’ve never seen before in Marisol McDonald and the Clash Bash/Marisol McDonald y la fiesta sin igual, coming this September.